World War II spawned a number of aircraft that became legends in their own times, and arguably, the B-17 "Flying Fortress" was the most famous, despite being outnumbered by the B-24 "Liberator". Yet the B-17 was not birthed easily as two factions in the Air Corps battled over guiding doctrine. The pursuit faction touted speed and maneuverability to clear the skies for ground troops to advance on the enemy. 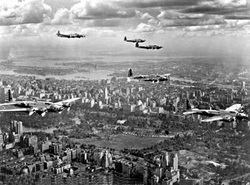 The bomber faction was convinced that strategic bombing could bring the enemy to its knees by striking its industrial might. 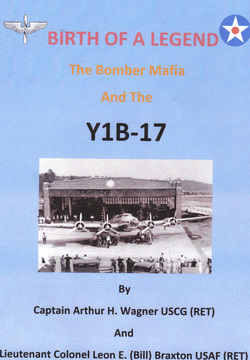 The "Bomber Mafia" was successful in bringing the first 14 Y1B-17s to the scene in the late 1930s, and they were an instant hit, paving the way for many more to come, just in time for WWII. The "Bomber Mafia" of the Air Corps Tactical School worked long and hard to promote strategic bombing concepts. After Major General Frank Andrews was successful in getting 14 Y1B-17s, Langley Field's 2nd Bombardment Group commanded by LtCol Robert Olds (BrigGen Robin Olds' father) demonstrated them at every possible venue.